I will pick you up from the shuttle bus at Picton Information Centre between 8-10a.m. depending on time of arrival of your ship. 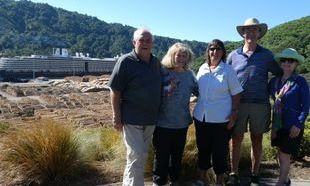 Your New Zealand Picton Shore Tour will take you through the beautiful Waikawa Bay and Marina to the Victoria Domain for high vantage points of Picton Port and Queen Charlotte Sound with your Cruise Ship in the backdrop. Your next stop will be a great lookout over Cloudy Bay and on a good day you can see the most southern point of the North Island of New Zealand. We will continue on your private tour to the magnificent Yealands Family Wines which is totally unique in that it is the world's first carbo NZero winery. This vineyard is set in the most natural panoramic surrounds with views to the Pacific Ocean and on a clear day to the North Island of New Zealand. They also boast New Zealand's largest solar panel installation. New Zealand I Drive will take you through the vineyard after you have enjoyed a wine tasting with sweeping views overlooking the Cook Strait, Cape Campbell and Mount Tapuae. There are many points of interest to view on your way. Your next stop on your cruise ship shore tour will be a drive through the Renwick area to the Village - a small selection of small local craft stores and also a chance to maybe try a scrumptious New Zealand Ice Cream made in Kapati. After this it will be on to Havelock a small historic fishing village the Green Shell Mussel capital of the world. There is also a delightful small museum here and a local art gallery for you to have a look at. I would suggest here you cannot leave without trying some Mussels. I will then return you back to your Cruise Ship via the stunning Charlotte Drive Sound with stunning views over it's bays and sounds. After this private cruise ship shore tour you will have a great taste of what the countryside and the surrounds of the Marlborough are about.